How much bling should I have on my Crystal Chandelier? Chandeliers do come in many shapes and sizes in fact you could well do a postgraduate doctorate study on all the different styles and how they have evolved over the years. Now contemporary chandeliers tend to be more a design statement which will fall in and out of fashion as time goes by. Also with a contemporary chandelier there are no strict rules and regulations and the design can be as wild and flamboyant as the designer’s imagination. You can have something very simplistic with a few twirls of stainless steel or indeed a few striking glass globes hung at irregular heights or at the other extreme suspended glass bubbles intertwined with fibre optic lines to produce a statement of style in decorative lighting. When it comes to traditional crystal chandeliers the landscape of design choices is more regulated. The designs for example Maria Theresa have been around for centuries and are proven and loved designs which have really stood the test of time. However at a more fundamental level 2 styles of traditional crystal chandelier are either the ornate brass armed chandelier or the glass armed style. The ornate brass armed chandelier tends to be more simplistic in design but would have some ornamental brass work both on the arms and the central piece of the chandelier. 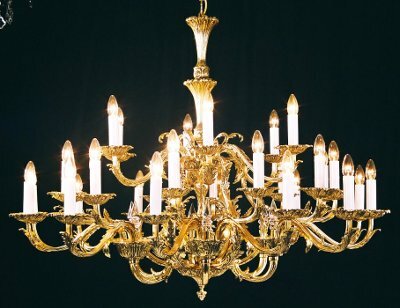 These brass chandeliers then would either have no crystals at all or just a splattering of crystal trimmings to add some sparkle to the ornamental light. If you analyse the chandeliers in stately homes you will more generally find the brass chandelier has been the favoured choice. It is a statement of design elegance and class but does not overpower the look of the room and take away too much attention from the other ornate design work in the room for example decorative cornices or an ornamental ceiling. 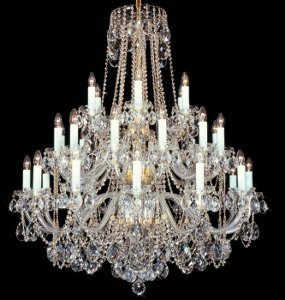 It this case the chandelier has a significant presence but is almost understated as a design artefact which means it can add the class without needing an abundance of crystal to take your eye. At the other extreme you might be looking for a single centrepiece chandelier to take attention and bring a real wow factor into the interior design concept. In this case then the more crystal the better and it is best if you see no metalwork at all. This then gives the maximised solution from a Bling perspective and will add a tremendous boost through the shear impact of the sparkling crystal in the room. Now it is important to use a high quality crystal and here one of the major contributors to the level of sparkle and high quality reflections is the lead content of the crystal. So you need to select a crystal with at least 24% PbO content to ensure that the light refracts through it to cast a multitude of reflections of all colours of the rainbow around the room when the sun shines through the windows. So that really sums it up in terms of the design choice on Bling and at the end of the day it does come down to personal choice.